When you have a home improvement or construction job to do, you will undoubtedly need a nail hammer. But, as one of the most standard tools available, there are hundreds to choose from. Should you choose the cheapest? The heaviest? Is a store brand as good as a national brand? What are the differences in hammers and what features set one apart from the other? Which should you choose if you are giving a hammer as a gift to a teen or husband building his tool chest? Using the right hammer really can make a difference in ease of nailing and soreness after the job. Have you ever used a cheap tool that left your wrists or hands tired the next day from over-use? When choosing hand tools, it is important to find the instruments that do the work and take the effort away from your joints and muscles. We have done the research for you and tested out hammer after hammer in effort to bring you the best of the best. So go ahead and make plans for that project with one of these great hammers. The Stanley FatMax Xtreme AntiVibe Rip Claw Nailing Hammer. Say that three times fast. This Stanley nailing hammer really takes the cake, thanks to all of its Caddilac-esque features! This is a real “man’s” hammer – the one little boys dream about having when they grow up. Add this to your toolbox and you won’t regret the purchase. And yes, ladies, you can proudly use it, too. Listed at $31.50, the Stanley FatMax Xtreme is absolutely worth its weight in the tool box. Choose between the 16 or 22 oz model. Strong men used to daily construction work will likely prefer handling the 22oz model, while occasional handymen, women and teens will appreciate the heavy duty features in the easier to manage 16oz model. The awesome one-piece forged steel design means this hammer just won’t break. In fact, it carries a limited lifetime warranty from the manufacturer, probably because you won’t ever need to replace it. In fact, you just might want to carve your name into this bad boy because everyone will be eyeing it. It is a durable, well-made nailing hammer full of great features, and won’t let you down on the job. Unlike traditional, cheap wood-handled hammers that can break, splinter, or get wear spots after a few years, the Stanley FatMax has a sturdy rubber wrap over its steel construction to aid in proper grip and performance. The fine texture on the handle is great for working outside where you might get sweaty hands. It also helps keep it cool when working in the sun. This patented torsion control grip technology helps you deliver a heavy blow to the nail you’re driving while softening the blow to your forearm. It claims to reduce the effects of torque on wrists and elbows. The AntiVibe technology will minimize vibration and shock at impact. Go ahead and hammer all day long because this well-designed hammer prevents that vibration and fatigue you might be used to from wood or fiberglass handled hammers. The FatMax gets its name from the larger nailhead than standard hammers in addition to a “fatter” grip at the base of the handle. The fatter grip aids with the vibration and control. The larger head is helpful for hitting nails in the dark or if you lose your glasses. In all seriousness, you will not miss with this hammer! Perhaps our favorite unique feature of the Stanley is the magnetic feature of the large nail head. Just set your nail head up to the hammer, which will hold it steady while you drive it into the wall! No more slamming a hammer into your thumb while you hold a nail against the wall. Just let the hammer do all of the work! Carpenters know a smooth face is desirable in a hammer because it won’t mar surfaces, so they must have had some experienced handymen on the design board for this one. The large, smooth, flat face hits nails with accuracy with the lightest amount of impact on the wall or other surface you’re driving into. Balance is possibly the most important consideration in choosing a hammer, and this one has every bit of even weightedness you are looking for. Cheap hammers have a light handle and a heavy head, causing strain on wrists and hands. Or, they might have a heavy handle and a light, cheap head, sending all of that impact and vibration up your arm and not doing the job well. The FatMax feels great in your hand and has a well-balanced swing to prevent fatigue and injury. Let’s talk about the rip-claw on the Stanley. While there may be some applications where a curved claw is useful, a straight rip-claw is preferred for general use. We like this one because the tapered end of the claw is thin enough to get under the edge of a can of paint and slide under a nail head to loosen it without marring the surface. It has just enough weight in the claw that it won’t bend, and we like that it is evenly balanced with the head of the hammer because it gives you an even swing both back and forward. The Stanley FatMax Xtreme AntiVibe Rip Claw Nailing Hammer is our number one choice overall because of its durability, weight, perfect balance, vibration resistance, and unique features. Stick this one in your tool belt and use it proudly at home or on the jobsite. There is so much to love about our #2 pick, the Maxcraft Stubby Claw Hammer. 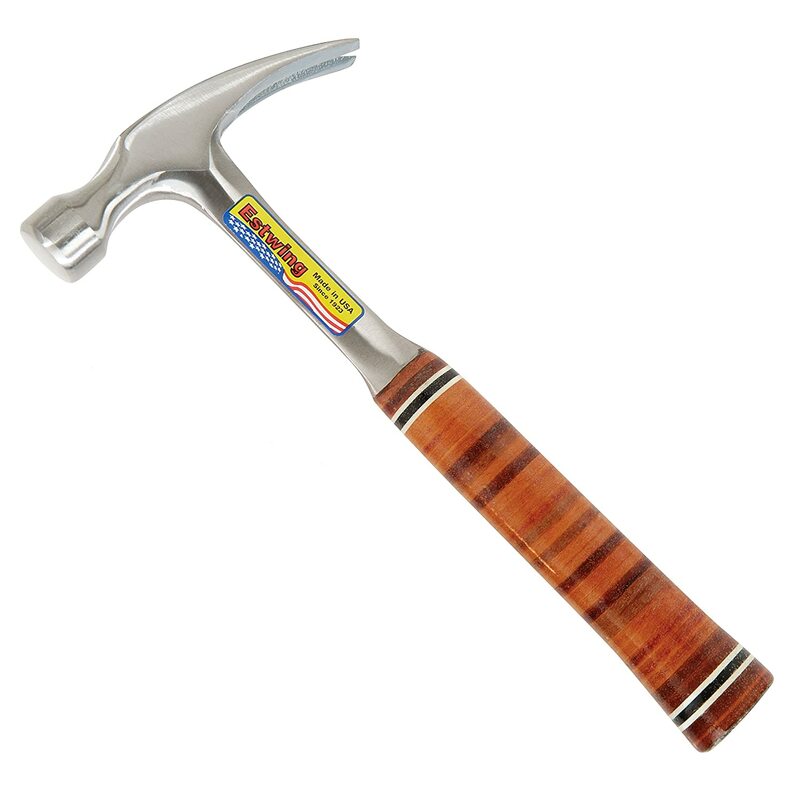 Maxcraft puts all of the features you need in a full sized hammer into this handy little 8oz hammer that is just 6.5” tall. You can throw this one into the smallest of toolbags and be ready to go in an emergency. When you need to get into tight spaces or corners, a long handled hammer just gets in the way. A stubby hammer solves the corner dilemma! Unless you are framing your basement or building on a deck, a stubby hammer can take care of about 90% of the common jobs in your home, and is great for little woodworking projects like birdhouses and models. So if you don’t need a full-sized hammer, the Maxcraft Stubby will be perfect for your daily home needs. The Maxcraft has a forged steel head with a magnetic groove to hold your nail – perfect for getting it started! Place the nail securely into the magnetic groove and give it a firm swing – your nail will lodge into the wall or other surface, making it easy for you to then tap it into place. This is unexpected feature in such a small tool is especially convenient when working in a corner or small space where you can’t get an extra hand in there to hold the nail in place to get it started. The smooth face prevents marring of the contact surface, which is especially important when working on little projects using soft pine. The short, comfortable handle that fits right into your hand helps with accuracy, helping you get the job done right the first time, without bending nails or losing them on the floor. For comfort, the Maxcraft has a sturdy yet soft, non-slip contoured handled grip. 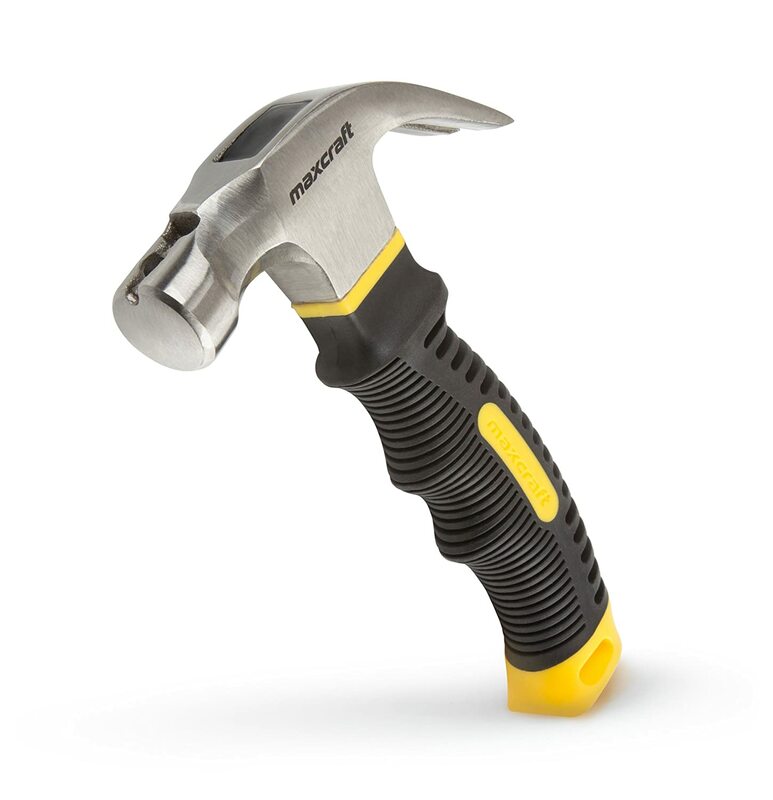 Since this is the kind of hammer you use in tight spaces or on small projects, you probably won’t need to worry about vibration control, but the rubberized handle helps soften the blow anyway. The backside of the grip has a larger texture for good airflow – great for preventing sweaty hands. The front side features a smaller texture as well as a molded grip for comfort. It feels great in your hand and doesn’t feel “tiny” at all. It’s everything you need in a big hammer, but sized to keep anywhere you might need it. The Maxcraft Stubby fits easily into a kitchen or office drawer and is particularly handy for little impromptu jobs that you just don’t want to run to the garage to get the big hammer out of the toolbox. It’s perfect to sit on your workbench for tiny projects because it won’t get in the way, but it’s always at your reach. It’s great on a kid’s workbench, in the Boy Scout tool box, or in the emergency bag in your trunk. And don’t forget people with arthritis or tendinitis – they just can’t maneuver a big handled hammer. The Maxcraft is the solution to so many needs! If you’ve never thought about all of the reasons why you need a stubby hammer, you should give this one a try. At just under 12 bucks, the Maxcraft Stubby Claw Hammer is a steal for a must-have tool. The Estwing takes a strong, single piece, steel forged hammer and wraps it in laminated leather for a comfortable grip and beautiful look. Forged in one-piece construction, this is the hammer that just won’t fail you. Ask any carpenter who has been at his craft for several decades, and he is likely to have this Estwing leather hammer in his toolbox. The laminated leather has a beautiful, high polish shine with gorgeous character. It is easy to grip, not likely to slip out of your hand, and is a showpiece in your toolbox. This is the hammer that gets passed down from generation to generation, filled with memories and indefinite use, the hammer that experienced carpenters feel lost without. Our favorite customer review states, “The grip is solid and controllable. The claw is at the correct angle and the overall geometry is perfect. Balance is terrific and will make it easier to swing this hammer like a real man. All of this comes at a reasonable price. Do yourself a favor and spend a little more for a tool that won’t let you down.” We agree. Estwing claims this hammer has unsurpassed balance and temper, making your swing steady and your strike accurate, saving you time in striking your nails the first time without bending or losing nails. This model also has a smooth face, as we’ve learned is key to reducing damage to the surface you are driving your nails into. It is perfectly finished, smooth, and polished to shine in your tool kit. The Estwing really is the big guy in the group. Weighing in at 24oz, you can count on a ton of power behind your swing. The leather handle hammer doesn’t feel overbearing, though, because of the evenly balanced weight throughout the handle. So go ahead, take your best swing. The Estwing Straight Claw Leather Handle Hammer is the standard go-to hammer carpenters love to get the job done. When you just need a light duty finishing hammer (think hanging pictures, securing a chair leg, pulling old nails, etc), you really don’t need to spend a lot on a professional framing or finishing hammer. The Stanley Hickory Handle Nailing Hammer is a great choice. You can pick this up for around $8, so it’s a nice basic hammer to pick up when you need to work on a quick project. Stanley offers a lifetime warranty on this model, so even at a low price, you can have peace of mind that you are not wasting your money on a cheap tool that will fall apart after a couple of uses. Inexpensive doesn’t necessarily mean cheap, and we’ve done our homework on low-cost hammers for you. Stanley chooses a forged high-carbon steel head to get the job done with a highly polished bell face to aid in minimizing the marring of your strike surface, making it great for nailing into surfaces from drywall to soft pine to hardwoods. The heat treated bell face prevents splintering and chipping of the metal. It is fairly heavy at 16oz, and there are 5, 7, 13, and 22oz options of this model as well. The weight in the head is what gives you good impact on your strike, and the weight is evenly balanced for a decent swing. The claw is slightly curved and does a fine job of pulling old nails. The hickory handle is evenly polished to prevent splintering and looks great in your toolbox. Although single piece forged steel hammers are the preference in this comparison, one thing we love about the wood handle is the ability to have personalization or a sentiment engraved or burned into it. This is a great gift idea for someone just starting out in the carpentry business, or for a first home purchase. If your search for a hammer is for light duty home projects, this is a great choice for a low-cost tool that will last a long time with a generous warranty. Keep this one in your toolbox, in the garage, or under the sink. Actually, at under $10, you could keep a couple around the house. The Stanley Hickory Handle Nailing Hammer will definitely meet your needs for everyday home use. No matter what you spend on a hammer, from the cheapest lightweight finishing hammer to tap in tiny nails to a big heavy framing hammer, if it is unbalanced you are going to be hurting after you use it. An unbalanced hammer puts unnecessary strain on your wrists and will send vibration up your arm. The weight from the head throughout the handle needs to be balanced for a smooth, steady swing and an accurate strike. As we’ve proven, there are inexpensive hammers that meet the even weight requirement, so don’t sacrifice safety and comfort for cost. Let’s face it. Tools are expensive. Most people build up a small arsenal of tools over a lifetime and spend quite a pretty penny in storing them in chests and tool boxes. So the worst thing is to spend money on a tool, only for it to break after a few uses. Look for single-piece construction and good manufacture warranties to save you headaches down the road. There is a common idea that more expensive means better durability, but you really can find durable tools at a low price. All of our top picks fit the bill of durability. Materials used to make hammers range from wood/steel to all steel. The material you want depends on the job that needs to be done. If you are looking for a good basic hammer for every day home use, a less expensive wood handled hammer is a fine choice that won’t break the bank. If you are working in the construction industry and will be framing houses all day, you will need an all-steel construction hammer. Be sure the hammer you buy is constructed from materials that meet the needs of the job at hand and you’ll be satisfied with your purchase. Especially if you are using the hammer every day, comfort is key. You need to look at the material and grip of the handle, how the weight feels in your hand, and the length of the handle compared to how you swing it. People with a tendency to swing from the wrist will find more comfortable with a shorter handle, while experienced carpenters who swing with their entire arm will be comfortable with a long handle. If your hands tend to sweat while you work, a grip with airflow is particularly important, and if you are prone to callouses, you might like a well-cushioned grip best. If you have strong arms and are used to doing heavy work, you might prefer a heavier hammer, whereas home users and teens might feel better with a lighter hammer that is easier to control. There are a lot of hammer choices out there. Consider the job you need to do and the possibility of future use of this tool before you make your purchase and don’t base your decision solely on price or looks. You need a balanced weight, comfortable grip, and sturdy materials for the best hammer. 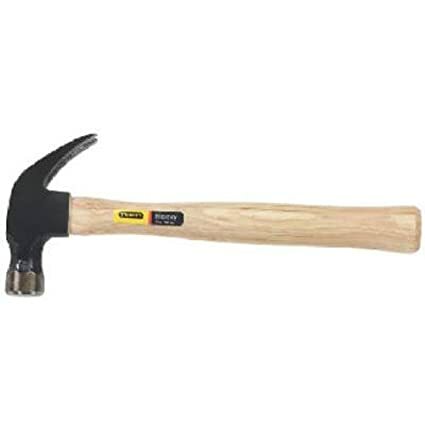 You don’t need a heavy duty, all steel construction framing hammer for hanging pictures in drywall in your home – an inexpensive wood handled finishing handle will do just fine for home projects. Likewise, you don’t want to save money by buying a light home use tool when you are going to be on a jobsite every day. Basically, look at all of your options and choose the right hammer for the right job and you’ll be happy with your purchase for years to come.